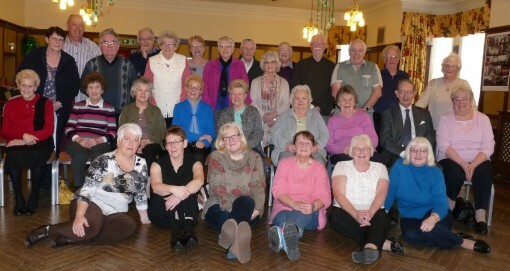 This year's weekend was once again at the Queens Hotel in Llandudno in February. Thirty-three people left Manchester for a weekend of fellowship and worship on the North Wales Coast. Our theme was "By The Seaside" and picnics. On Saturday morning we 'dipped in' to three corners of the ballroom. In one corner there was the chance to think about the feeding of the five thousand and what gifts we have that we can offer to God just as the boy with five loaves and two fish. People were invited to write their gifts on templates of loaves and fish and put them in a net (fish) and basket (loaves). In another corner copies of the morning papers were provided and people were asked to cut out articles of events that concerned them and paste them on to a large roll of paper with comments or prayers. The third corner had a number of meditational videos playing for people just to sit, watch and listen. People were invited to spend as little or as much time as they wished on the above before coffee was served. This still left time for a walk or some retail therapy before lunch. Our worship on Sunday afternoon looked at two Bible 'picnics'. First the Feeding Of The Five Thousand and also at the breakfast on the shore after the disciples had been fishing. We looked at how the characters in the two stories would have felt and how Jesus was sought after in the first story and how Jesus sought out the disciples in the second story. We discovered that it did not matter how we met Jesus but how we responded. Our gifts from Saturday morning in the net and the basket were offered with our offering which went to 'All We Can' (previously Methodist Relief and Development Fund). The newspaper cut-outs and prayers were used as a basis for our prayers of intercession. We also had our usual Friday evening Quiz and Saturday concert. The concert was its usual standard (brilliant!). Everybody enjoyed a weekend of fun and fellowship.